Travels in my back yard: There is a "there," there. 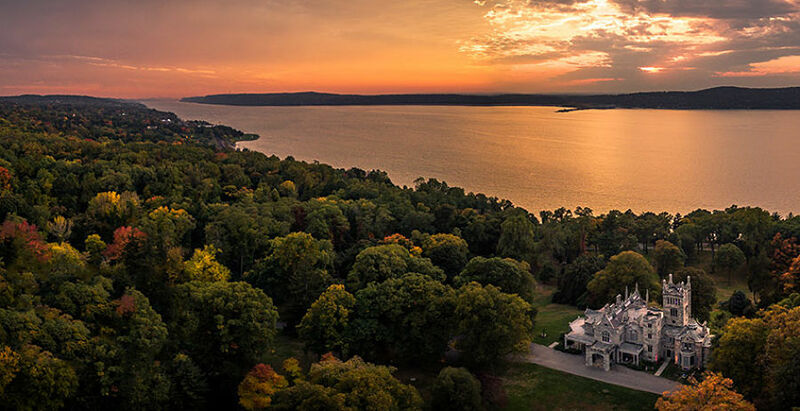 Aerial sunset view of Lyndhurst Mansion and the Hudson River in Tarrytown, NY. Gertrude Stein once wrote, “Anything one does every day is important and imposing and anywhere one lives is interesting and beautiful.” Of course she was living in Paris, France, at the time, not Paris, Texas, so I take it with a grain of salt. But after being back in Tarrytown for five months straight now, I realize what an interesting and beautiful and unique place it is. That realization was brought home to me when some guests from Rochester, New York, on my Sleepy Hollow Halloween Tour remarked on the hilly terrain and the narrow winding streets of this former Dutch colony, so unlike the flat landscape and straight streets of their own hometown. Gertrude Stein in the Luxembourg Gardens in Paris with Ernest Hemingway's first son Jack or "Bumby." In fact, the name “Tarrytown” is a corruption of the Dutch word for wheat, “twere,” which grew well in the local soil, and “town.” Its hills, hollows, and dales were the inspiration for Washington Irving’s 1820 story “The Legend of Sleepy Hollow” which still inspires people nearly 100 years later to visit the area especially during Halloween. Historic Main Street in Tarrytown, NY. My guests also remarked on the lack of shopping centers in town – this is because all the land was already in use by the time chain and box stores came along. This allows our unique independent retailers and restaurateurs on and around Main Street to thrive. Gertrude Stein said of Oakland, California, “there is no there, there.” What she meant was that her former home had been torn down, but now that phrase is used to mean a place without personality. Well, there is definitely a “there” in Tarrytown. Simone Simon singing in The Curse of the Cat People set in Tarrytown, NY. Many movies have been filmed on and around Tarrytown’s unspoiled and classic Main Street, so it’s not a surprise that the street looks familiar to visitors. The strangely titled but eerie 1943 movie, The Curse of the Cat People, starring Simone Simon was set in spooky Tarrytown. Its producer, Val Lewton, grew up not far away and was a fan of “The Legend of Sleepy Hollow.” It has one of the most beautiful song settings I have ever heard, a Christmas song in French called “Il Est Né, le Divin Enfant” – “The divine child is born” – which Simon sings in counterpoint to a group of carolers singing “Shepherds Shake Off your Drowsy Sleep.” It gives me chills. Tarrytown's historic Main Street decked out for the holiday season. Photo Jeffrey Friedkin. The citizens of Tarrytown and its sister village, North Tarrytown, renamed “Sleepy Hollow” in 1997, are aware of their villages’ unique beauty and enhance them with decorations for each holiday, in particular Halloween and Christmas. For Halloween, there are scarecrows attached to each old-fashioned lamppost, unique Halloween themed displays in the stores (no visual merchandising managers involved), and windows painted by children. For the winter holidays, each tree on Main Street is wrapped in twinkling white lights lending it a magical air. If it snows, even better! Tarry Tavern dining room on Main Street in Tarrytown, NY. We’re celebrating the magic and mystery of Tarrytown and Sleepy Hollow this holiday season with our Magical Mystery Holiday Tours which will envelop us in the warm glow of a small-town holiday celebration. Each night is different depending on what is happening in town. 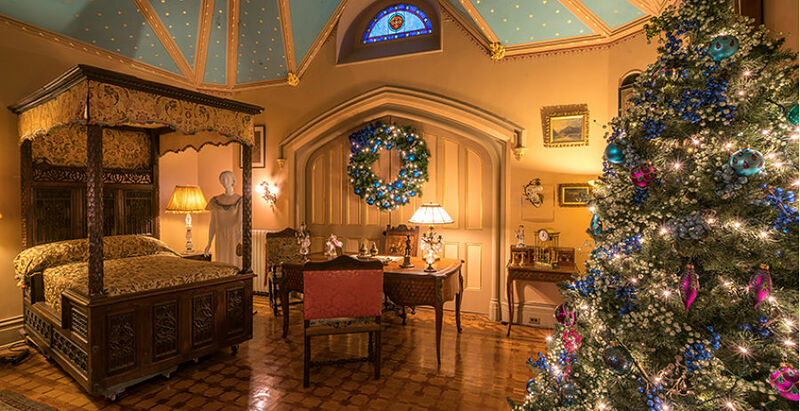 Every night includes a visit to holiday decorated Lyndhurst Mansion, once owned by railroad baron Jay Gould from Roxbury, NY, (another of my favorite haunts) in the Catskills, described as one of the “Ten Best Historic Holiday Tours” by USA Today. On Saturday, November 25, we’ll celebrate Small Store Saturday with a walking/shopping tour of historic Tarrytown, a guided tour to Lyndhurst Mansion, and dinner at the Tarry Tavern, a modern farmhouse style eatery. You’ll leave town with some unique presents as well as a warm glow, and not just from the wine! The Adventure of the Blue Carbuncle in progress at Lyndhurst Mansion. Photo Lyndhurst.org. 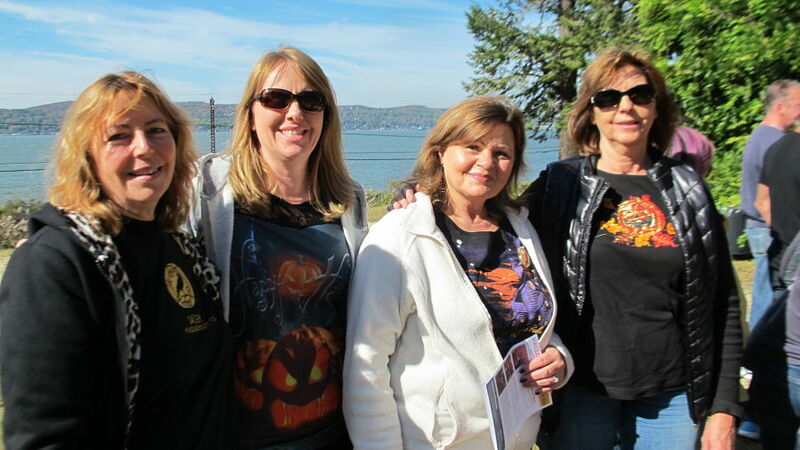 Peg and her family during our Sleepy Hollow Halloween Tour 2017. Photo Elizabeth Kemble. Michael and Amber during our Sleepy Hollow Halloween Tour 2017. A bedroom worthy of a Duchess at Lyndhurst Mansion in Tarrytown. Photo Lyndhurst.org. RESERVE NOW as tours are limited to 6 people per day. Tickets to the Adventure of the Blue Carbuncle are sold out, but I have some for 6 lucky people! Plan your post-Thanksgiving celebration today! Call me, Liz, at 914-909-5079, email liz@travellati.com, or reserve online by clicking “Order.” See you in downtown Tarrytown! Guests on our Papa's Paris Tour doing the time warp. Photo Elizabeth Kemble. And remember, Early Bird Pricing ends November 17 for our Picasso’s Pyrenees Tour in May and our Papa’s Paris Tour in June. That’s only six months away. Call me today and save $520-$670 off each tour. Give yourself the gift of a unique and fabulous vacation to look forward to!